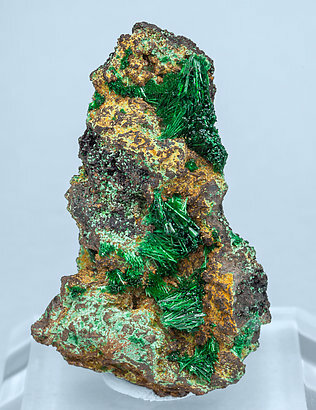 Spray-like aggregates of acicular Malachite crystals that are translucent, very luminous, have a bright especially intense color and are on limonite matrix. A German classic. We’ll send to the buyer the original label and also a copy of the computer card with the full collection catalog text. 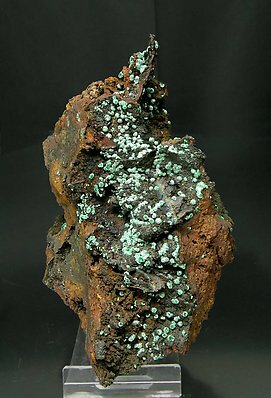 Stalactitic Malachite growths, on matrix, elongated and with spheroidal thickenings on the terminations. 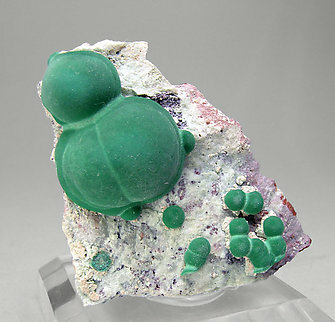 They are bright with an excellent color, very deep and uniform. 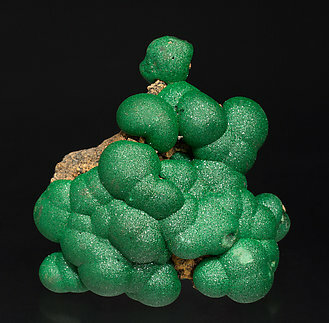 Botryoidal growth, on matrix, with neat and bright surfaces and a clear green color. 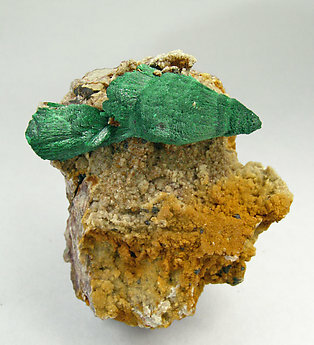 It is from a not so well known French locality. 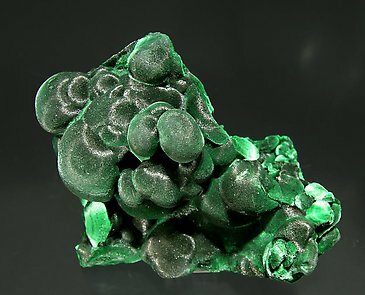 Globular Malachite growths with a velvety brilliance. 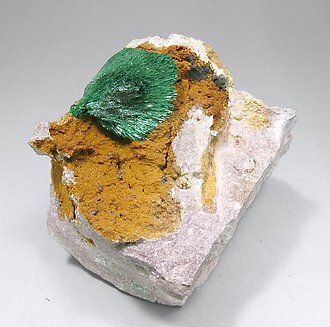 Very elegant and original specimen on a Limonite matrix. 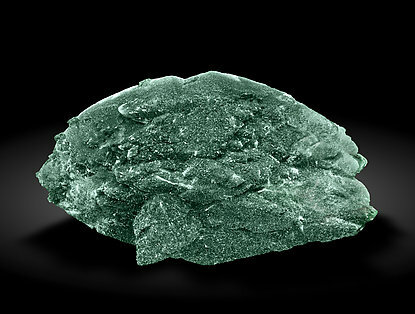 Analysis has been done to provide the correct characterization due to its resemblance to other possible species. 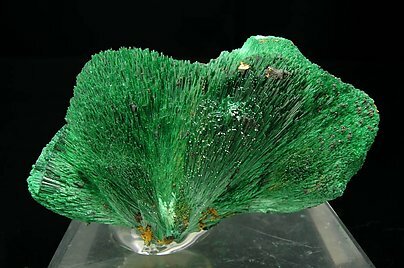 Esthetic and fine fan growths of acicular crystals with color zoning and a very well marked velvet luster, on matrix. 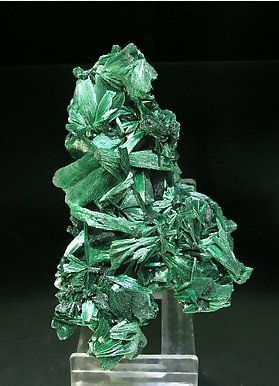 Radial and very thick Malachite groups formed by very thin acicular crystals, with a small matrix in the back. 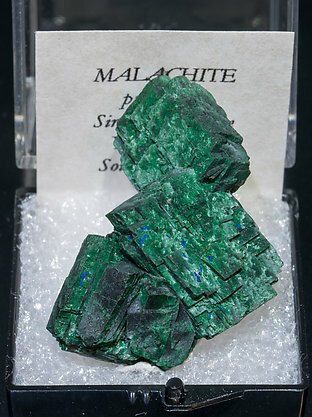 Malachite radial groups formed by very thin acicular crystals, which show a very clear banded color zoning. On matrix. 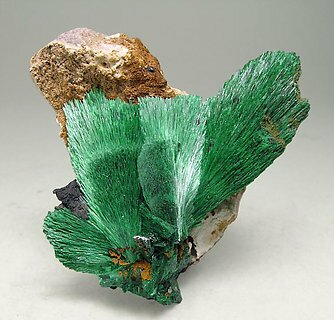 Fan-shaped growth of crystals between fibrous and acicular, on matrix. 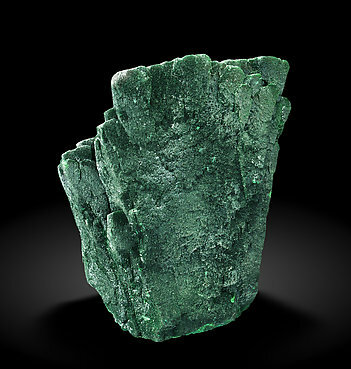 Curving of the crystals produces changes in luster and color conferring a velvet aspect to the piece. 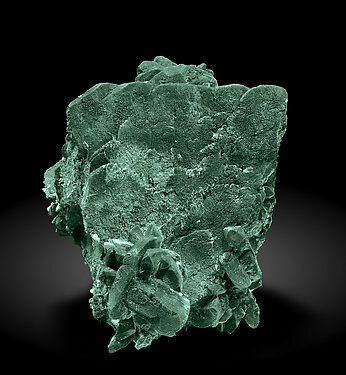 A kidney-like, very esthetic, intensely colored form that has a brilliant but satiny surface. 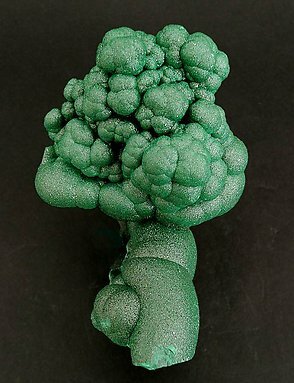 Very aerial and esthetic botryoidal growth with very deep, vivid and uniform color. 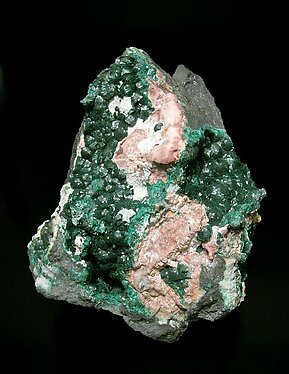 Very esthetic and well marked botryoidal growth, on matrix, with the color brighter than usual, very uniform and with an excellent silky luster. 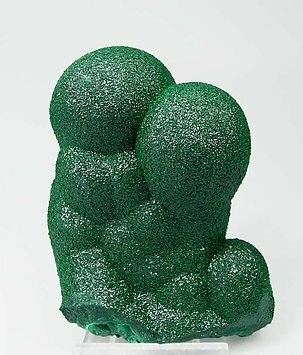 Very well defined spherical growths of a very uniform green color that contrasts with the light colored matrix. 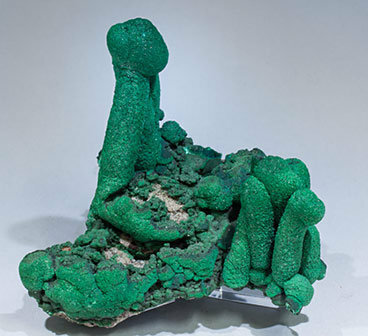 Nice specimen with unusual fan-shaped growths formed by acicular Malachite crystals, with velvet aspect brilliance. 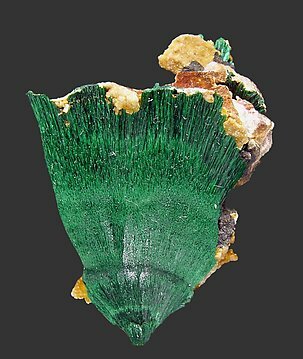 From a Shaba locality not yet well known by mineral collectors. 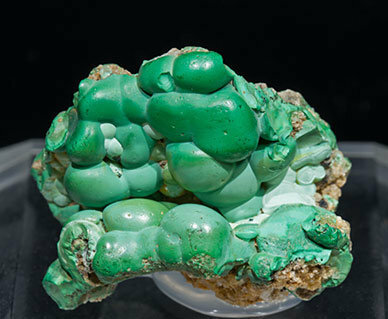 Botryoidal growth with radial growths lower on the specimen. 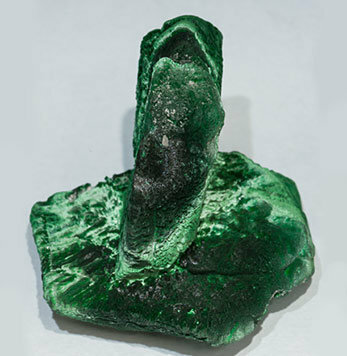 Its very deep color and the silky luster made the sample very esthetic. 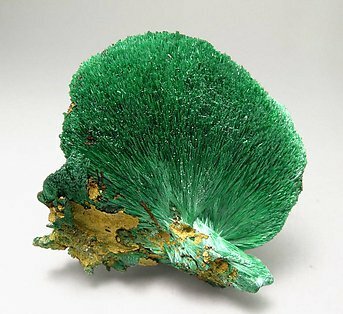 An old sample, very attractive, in which the Malachite forms crystals of curved edges and faces giving them a nearly spherical shape. 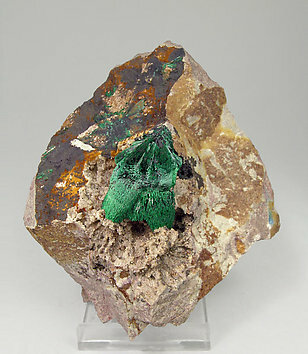 The esthetics of the piece is enhanced by the strong contrast of color between the Malachite and the lighter matrix. 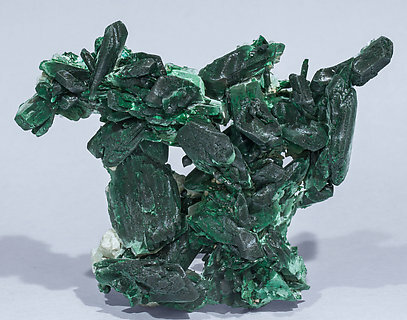 Aerial group of Malachite crystals after Azurite. 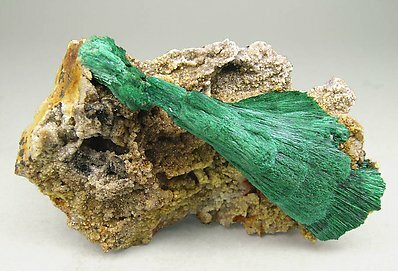 They are very sharp and flattened, with polycrystalline growths.